Staff at Time & Tide Museum have created a Reminiscence display which is full of interesting things to prompt visitors to share their memories of life from the 1950s to the 1980s. 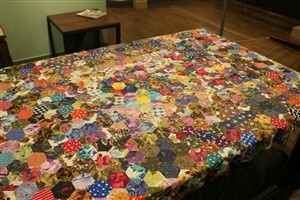 Patchwork and quilting has been having a bit of a revival in recent years but this original quilt is displayed over the Morrison shelter in the museum. Staff in the office have been sharing our patchwork memories. Does anyone have memories of patchworking they want to share? This page was added by Colin Stott on 04/10/2013.